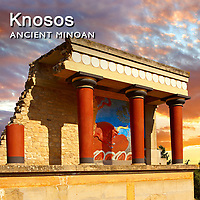 Pictures, images & photos of Knossos Palace the largest Bronze Age Minoean archaeological site on Crete. Stock images of Knossos Palace & photo art prints to download on line. Knossos (alternative spellings Knossus, Cnossus, Greek pronounced kno'sos, also known as Labyrinth, or Knossos Palace, the ceremonial and political centre of the Minoan civilization and culture.